No words can describe our deepest appreciation of the mentorship and positive influence of Shihan Ty Aponte on our son, Casey. Shihan Ty Aponte is a traditional Shotokan instructor with a modern-day approach. With overflowing humility, he incorporates a strong and traditional foundation, mentally, physically, and academically, into each and every one of his students while also exposing them to a broader and more eclectic experience of the martial arts. His "out of the box" thinking distinguishes this dojo from others. 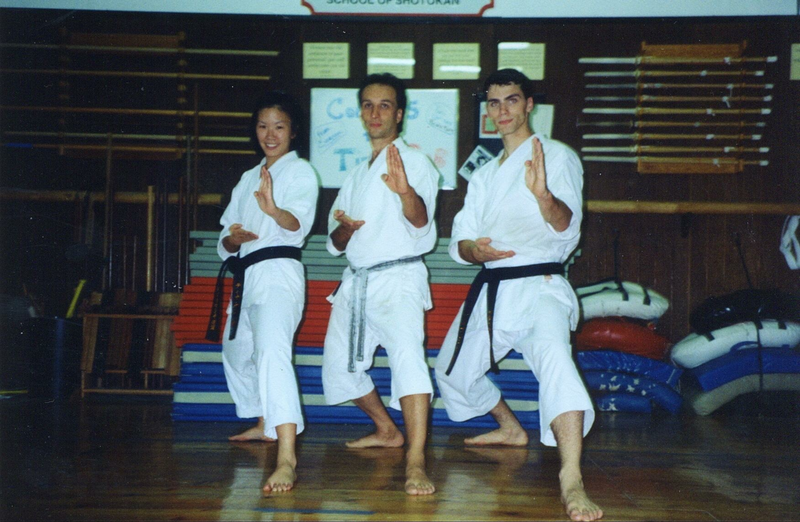 For 16 years, since the age of six, Casey trained under Shihan Ty Aponte along with a diverse group of instructors including Sensei Mike Whiteside, Sensei Lynn Aponte, Sensei James Augur, Sensei Robert Johnson, and Sensei Leo Shortle. This structured and nourishing environment influenced both his mind and body and helped him to achieve success academically and in the martial arts. He is a 3rd Dan Black Belt and a 2nd year medical student. Douglas: Hello, my name is Douglas Cruz and here’s my son Fabian Cruz. He’s a nine year old. The reason why we enrolled in martial arts is because it provides discipline and it provides mental strength. Him being very shy, I thought it was going to be a good idea to have him express himself and be more disciplined and it’s been paying off very good. We came over here and saw all the many belts, black belts, throughout the years, so this school has been here for years and years. At first we brought our daughter -- she went through the whole belts and now she’s a black belt and now she’s in college now -- and then we started with my son, so he started fresh with this new school. Fabian: It helps me get stronger and it gives me something to do when I’m really bored when I’m at home, work on my karate kicks, refresh my memory of those, everything I did, and help me protect myself. My son Max started training at the USKL dojo when he was seven years old. I remember watching his beginning white-belt class and marveling at the maturity and poise of the very young junior-black-belt instructor who was helping Sensei Ty Aponte teach the little kids. Max is now 17 years old. He is a first-degree black belt himself and I can see in him that same maturity and poise. Max also assists Sensei Ty in teaching new classes of beginning students. During the intervening years, I have watched and learned how karate, as taught by Sensei Ty and the other USKL instructors, means so much more than just mastering the physical aspects of a martial art. I have seen my son grow self-confident and self-reliant by leaps and bounds, and I know that much of the credit belongs to Sensei Ty and the excellent way he interacts with young children. I especially admire the way USKL inculcates in its students such a strong sense of respect: self-respect, respect for peers, respect for teachers, and respect for the traditions of karate. I can truly say it has been a wonderful experience watching my son grow up as part of the USKL family. Good morning everybody. This is DT here. I decided to come in this morning and get a workout at my dojo and I thought I'd give you guys a quick tour of the facility. This building was just completed this year and completely funded by a member [thank you, Sensei James Augur!]. There is the ceiling, just unbelievable. This place was completely envisioned, designed, and constructed - everything was built by hand - not a lot of pre-fab stuff here. You get an idea of the ceiling and the lighting in here. So, this is what I do in the morning, I sneak in here and, like I said I'm really fortunate to have the keys to come in and work out pretty much any time I want. What I kind of wanted to go over today was: some of you that are training in sports like I did all my life I got tired of running stairs and bicycling and different things like that. You know, martial arts is a good way to transition into different things and it's a good cross-training way to train as well. Your cardio is off the chart. Anyone who thinks you can do an hour class in your first month, I'll tell you, it will take you to your limits but then your body adjusts pretty quick. The best part is, you're never going to be a victim when you learn a little self defense. It's really helped me throughout my careers, especially in ski-racing. I'll tell you, I cornered the market on 100 mile per hour crashes and never got seriously injured and I attribute this as a big portion of it. So, anyway, I just thought I'd share that with you guys. The best part of training here is right behind me is an In-N-Out. If anybody you know knows In-N-Out burgers, the number 1 is to-die-for with ungrilled onions. So you know what I do when I'm done training -- I get in the car and go home because I know better. Take care you guys and hope you enjoyed this. My wife and I trained at USKL for four years during college, starting as white belts and earning our black belts before we graduated. Having never done martial arts before, we were so fortunate to have found such a special dojo to train in the martial arts. Sensei Ty not only teaches traditional shotokan karate, but also incorporates techniques from other styles, including aikido, judo, kung fu, and weapons, among others. This unique teaching style made workouts challenging and fun. It was the best shape we have ever been in in our lives, both physically and mentally. More importantly, the dojo became a home away from home for us. It is a testament to USKL and the leadership of Sensei Ty and his senior instructors, that even now, twenty years later, some of the same members of the dojo still train there. We moved away after college, but we come back to visit whenever we're in the area. We envy those who get to train in the beautiful new dojo. Anyone interested in martial arts for themselves or their children should look no further. The quality of instruction at USKL is excellent, and the quality of the people is even better.